Do you enjoy eating fruit? Many people do. Whether it is because fruit is sweet and juicy, or because it is so good for our health, it is important to include a variety of fruits in our meals each day. Fruits are high in vitamins, low in fat, low in calories, and high in water content, which will help keep your body slim and well hydrated. You can add slices of fruit to your favorite salad recipes, pulse them into a smoothie, or serve them as a delicious and healthy dessert. We already talked about all the health benefits of lemons a few months ago, but there are many different kinds of fruits that help you look good and feel good. 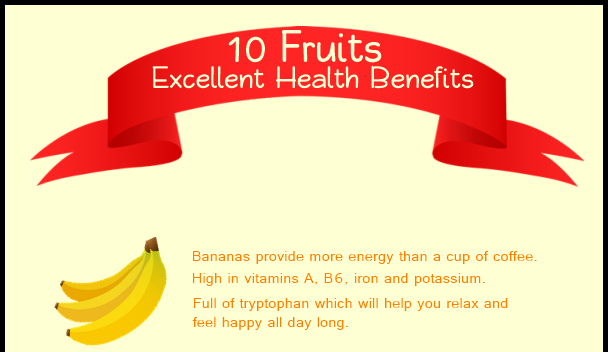 Here are 10 fruits that offer excellent health benefits. Which one is your favorite?